Get your FUN on and Build a Sandcastle! A day at the beach on Hilton Head is always a good thing! 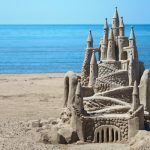 Saturday at Coligny there is a Sandcastle Festival! CLICK HERE FOR DETAILS!